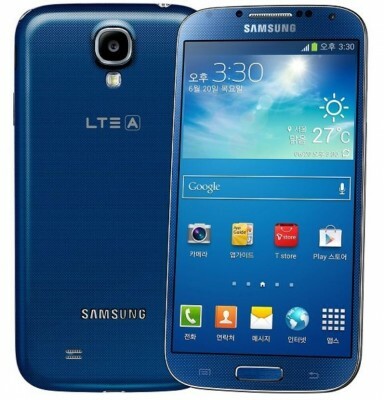 Samsung Galaxy Grand Quattro is quad-core android smartphone with 1GB RAM. This is budget quad core device and so it has processor not equal to that present in Galaxy S3 or high-end quadcore. 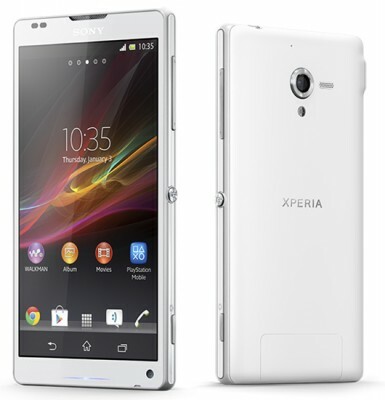 It has Cortex-A5 based chipset. So, let’s see how it performs in comparison to other quad-core smartphones like Galaxy S3, HTC One X, Galaxy S4. You’ll be amazed by the result. 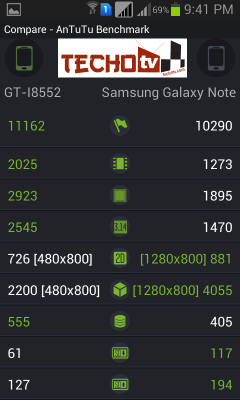 (If you’re new to benchmarking, just take these benchmarking android apps as scale or unit system of measurement which employ several resource intensive tasks to compute the raw power of chipset). In this video embedded above, I’ve run a series of benchmark tests to find out the raw power of galaxy grand quattro. I’ve also checked its startup time. It takes about 39 seconds for the handset to boot. Add couple of more seconds for the networks to register on both the sim cards. Before launching benchmarking apps, I ensure that none of the apps are running. I also clear RAM as well. 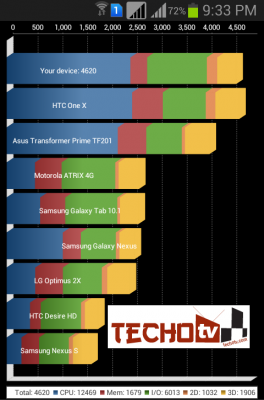 On Quadrant benchmarking app, surprisingly it scores 4620 points just few points falling short of HTC One X, which was launched last year and also houses quad-core cpu. On AnTuTu benchmark test, which is also comprehensive benchmark test, it scores 11,162 points. 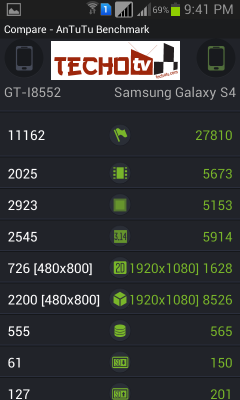 Comparing it with other popular handsets scores from AnTuTu public database. 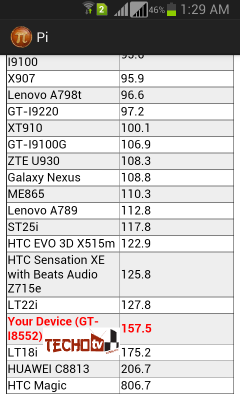 As you can see, in one of the tests here, it has score even higher than last year’s Samsung flagship -Galaxy S3. Comparing the score with Galaxy Note, here again Quattro has better scores (to remind you, Note has dual-core processor). 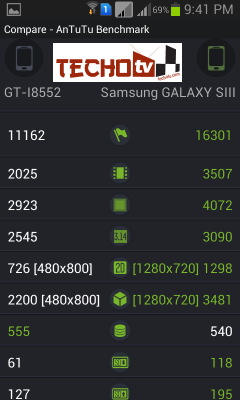 In Galaxy Grand Quattro comparison with this year’s flagship of Samsung that is Galaxy S4, you can see Galaxy S4 is 2.5 times more powerful as per scores. Well, if we compare the market prices, the difference is the same, I mean, the Galaxy S4 is around 2.5 times expensive than Grand Quattro. Surprise! Now, here we have galaxy s3 scoring much higher than Grand Quattro. 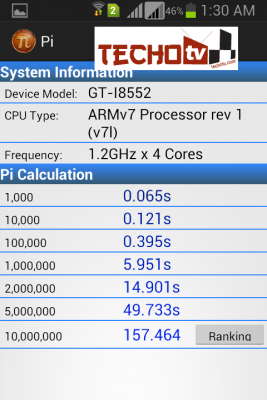 Well, AnTuTu benchmarks are highly unreliable. 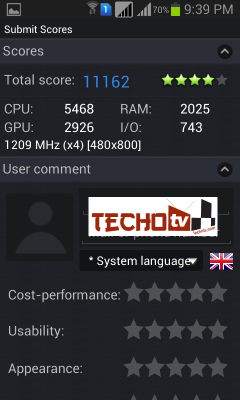 As per my experience, If the AnTuTu test is run again on this handset, it may result in much lower score the next time. So, we always take the first AnTuTu run as the best score for any new handset. 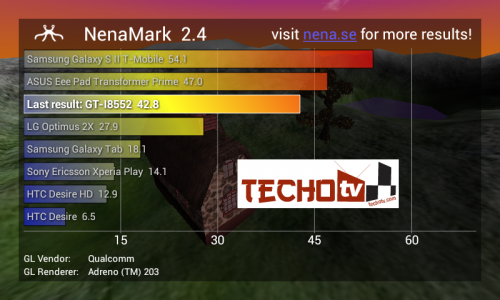 On nenamark2 graphics benchmarking tool, we’ve score of 42.8fps. Now for measuring computing performance of cpu, we run pi benchmark in which we’ll calculate value of pi upto certain digits. In the final score, as you can see it took 157.5 seconds. Lower is considered better. 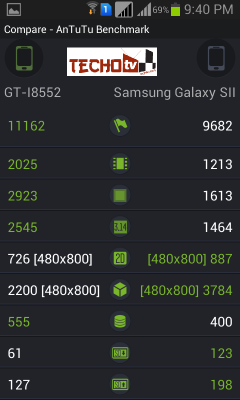 You can see that even dual core cpu of galaxy s2 has much better scores. Stay tuned with us for full in-depth review!